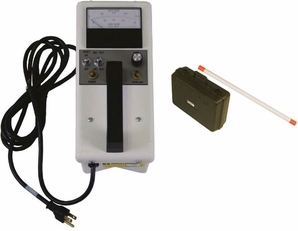 Hastings Hotstick Tester can be used on Wet or Dry Fiberglass Hotsticks. The tester has a selector switch for wet or dry tests and a dual range scale which gives theoperator leakage current values in micro amps. Utilizing a 2,500 volt output, the Hotstick meter is calibrated to indicate the leakage values that would be present if 75KVAC were applied to a 12” section of the fiberglass tool for the wet test and 100KVAC per foot for the dry test. The Fiberglass Meter is oortable and lightweight for easy use. Two models available 120 volt or 220 volt systems. The hotstick tester is designed to protect the operator while in use. The Fiberglass tester comes complete with a padded carrying case and directions for proper use. A testing bar is also provided to ensure the tester is working properly. Application and training video is also included.